Why choose Colyn Hair Removal Kit? your multiple personal care-hair removal,epilator, bikini trimmer and callus removal. comfortably shave legs, underarms,arm and other body areas. area and removes unwanted longer stray hairs with pop-up trimmer. 40 minutes of running time for each full charge. service before you decide to buy. 4 in 1 Kits: The Colyn C1 4 in 1 ladies Hair Removal Kits have 4 changeble heads-for hair clipper,epilation, lady shave and feet callus removal. Lady Shaver: Dual trimmers for quick and easy shaving, for those who have a non-epilator preference for certain body parts like bikini line or underarms. 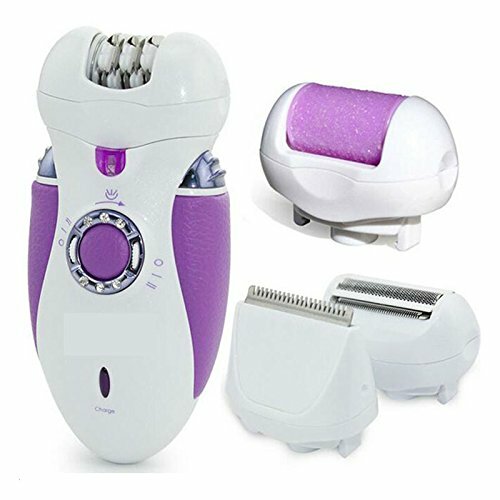 Electric Epilator: the efficient and gentle epilation systsem removes hair from the root make your skin smooth like silk. Hair Clipper: enable you to clip long hair to short to prevent unnecessary pain before epilation. Callus remover: removes dead and hard dry skin on feet to achieve supreme silky smoothness in a few minutes.